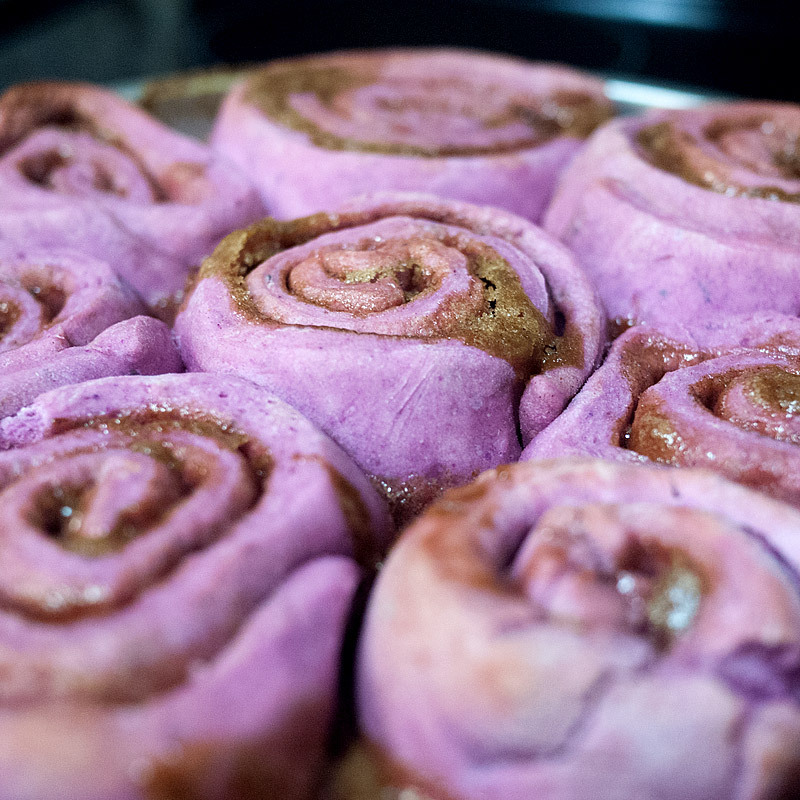 Ooh, cinnamon rolls sound good… what kind though. 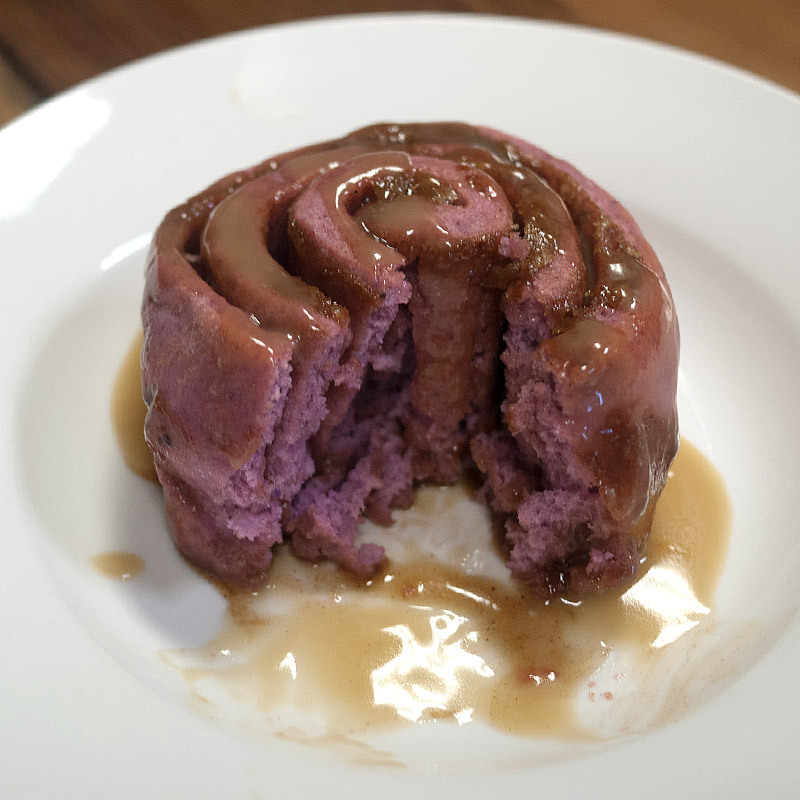 Ube is a traditional ingredient in Filipino desserts. It’s a purple yam used in sweet rice cakes, layer cakes, filling for sweet buns. It’s everywhere, and usually served alongside grated coconut, which ended up being the inspiration for the glaze – Salted Coconut Cream Caramel. 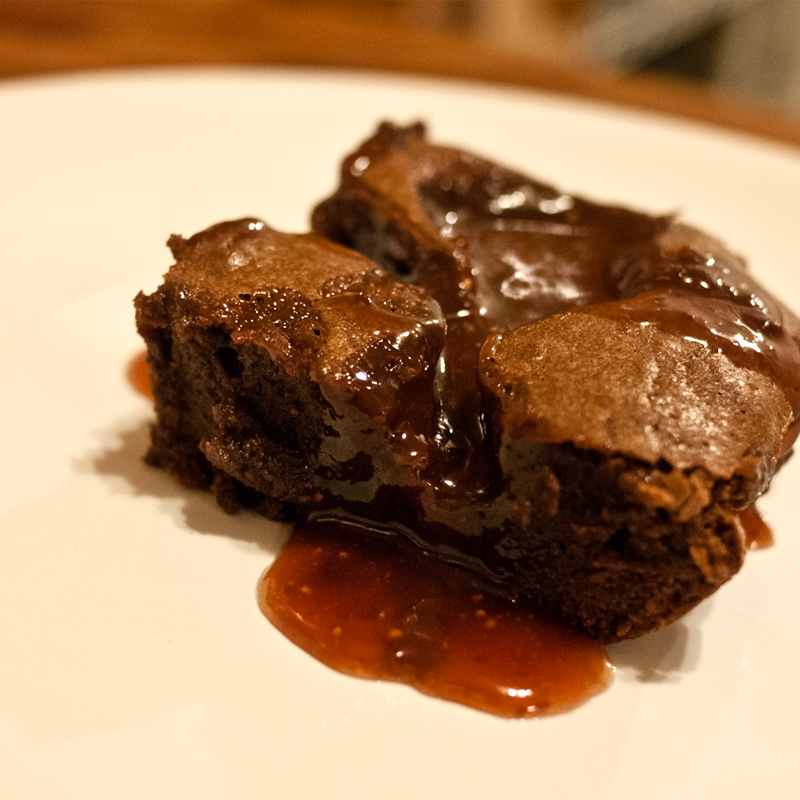 That glaze also happened because I ran out of butter (I know, I know… wtf, FMITK?) but I had coconut milk on hand, so it all worked out. This looks a lot more complicated than it is. I promise. It takes some time though. She’s a labor of love. 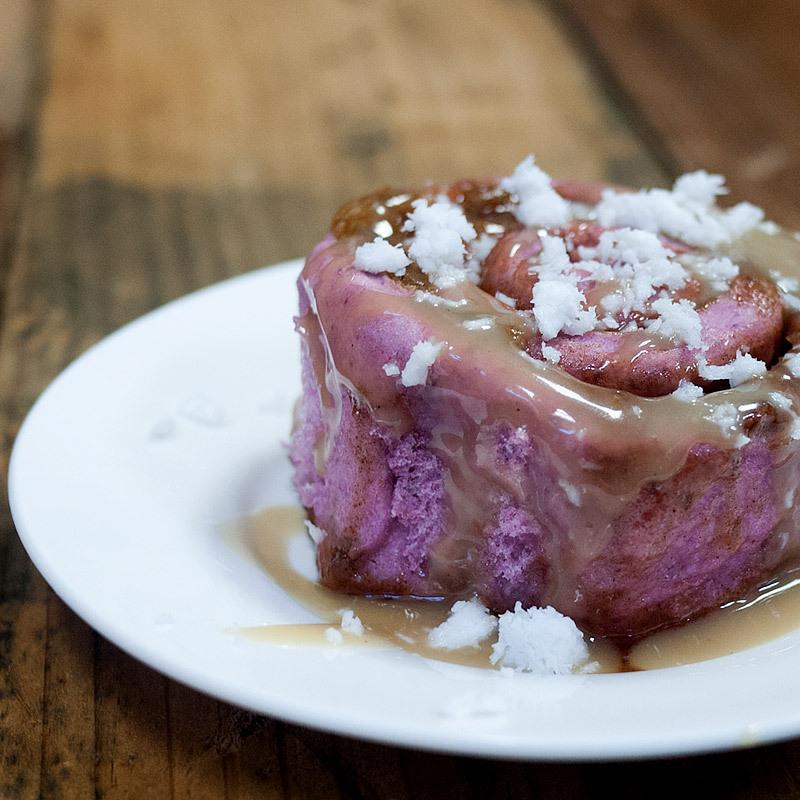 Sweet, delicious, purple love. You can find purple yams either fresh or frozen. I found mine frozen at Seafood City. If you find them fresh, just bake them then puree. Frozen works fine though. Also, if you’re opposed to purple food, sweet potatoes, pumpkin and yams can work well in this recipe, too! 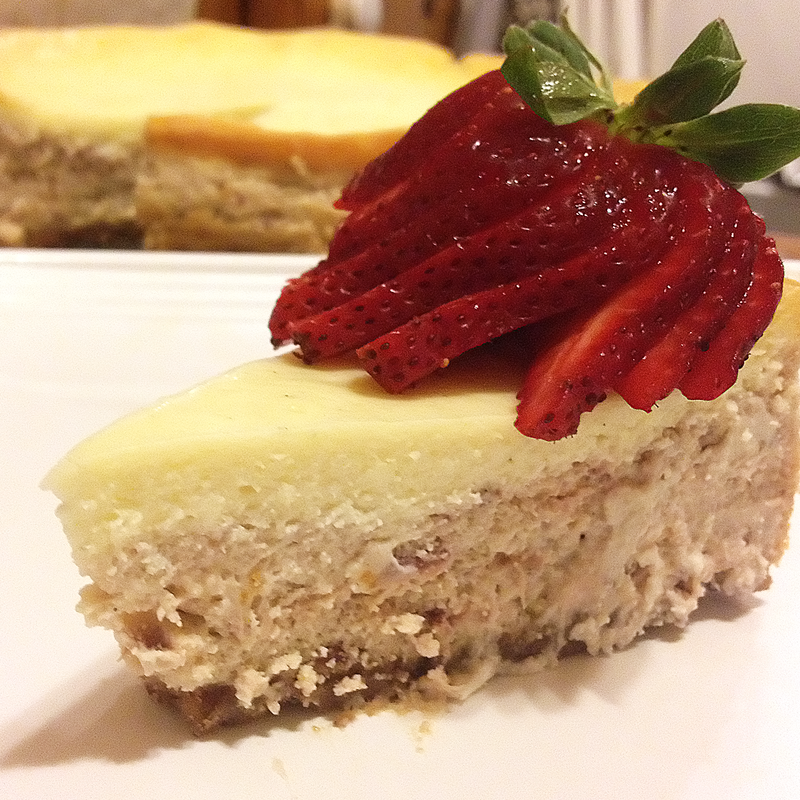 This recipe gives you two options – bake right away or bake the next day. 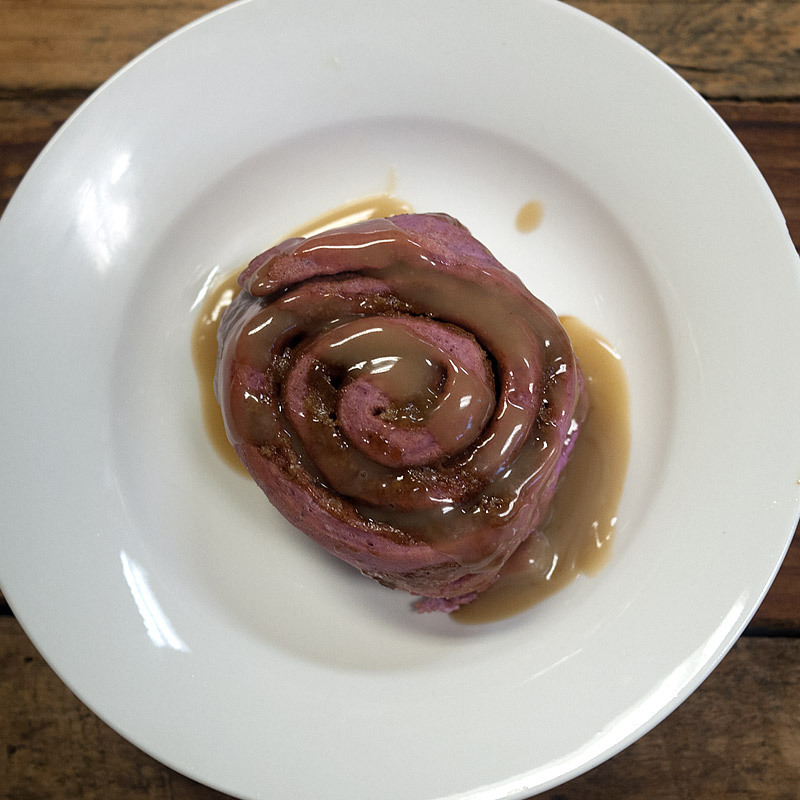 If you want fresh cinnamon rolls in the morning without having to wake up at 5AM to start on them, the overnight / plan ahead version is for you – the dough can stay in the fridge for up to 16 hours. If you want them right away, then preheat the oven! Let’s start with the dough. 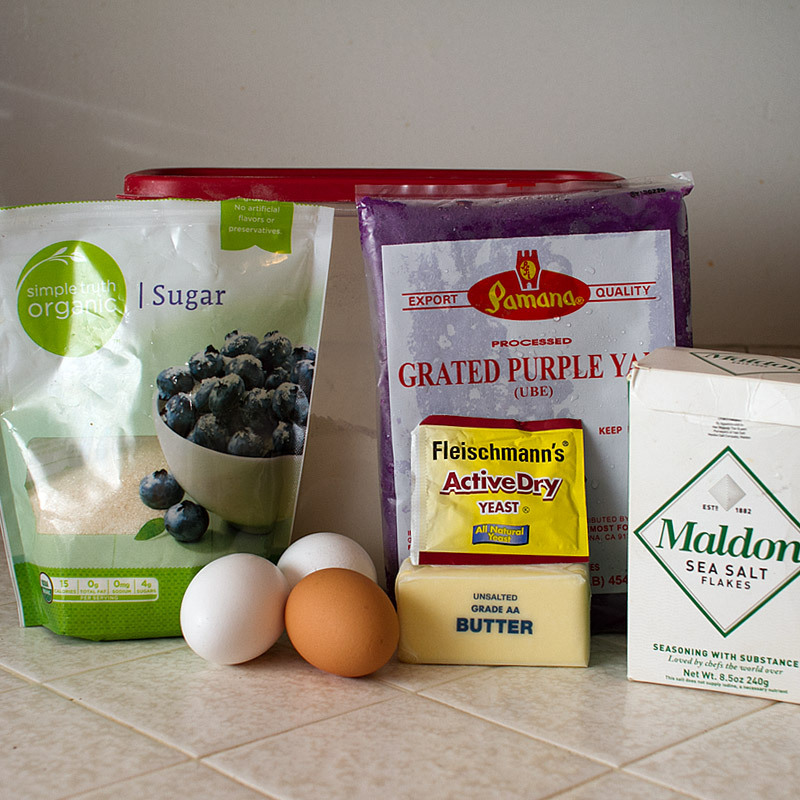 Sugar, flour, grated purple yam, sea salt, yeast, butter, and eggs. Start by getting the yeast … yeasty. Combine sugar, warm water and yeast in the stand mixer bowl (if using a stand mixer) and let “bloom” for 5 minutes. Right pic is 5 minutes into blooming. 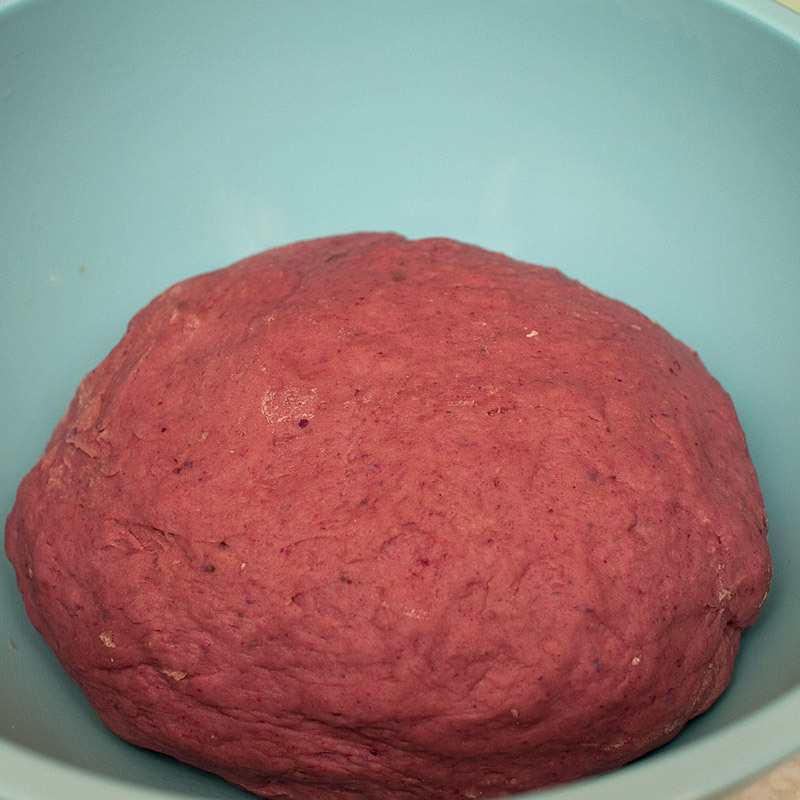 While the yeast is blooming, combine eggs, melted butter, 1 cup of flour and ube in a medium bowl. How gorge is that purple? I didn’t even photoshop it! 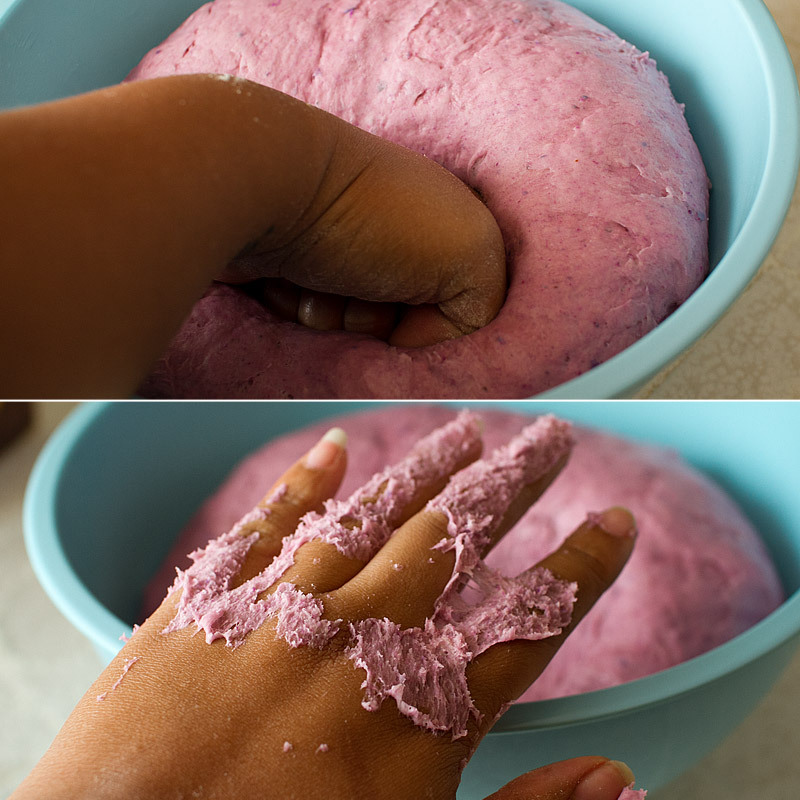 Combine the ube mixture with yeast. Add in flour, 1 cup at a time, until well incorporated. 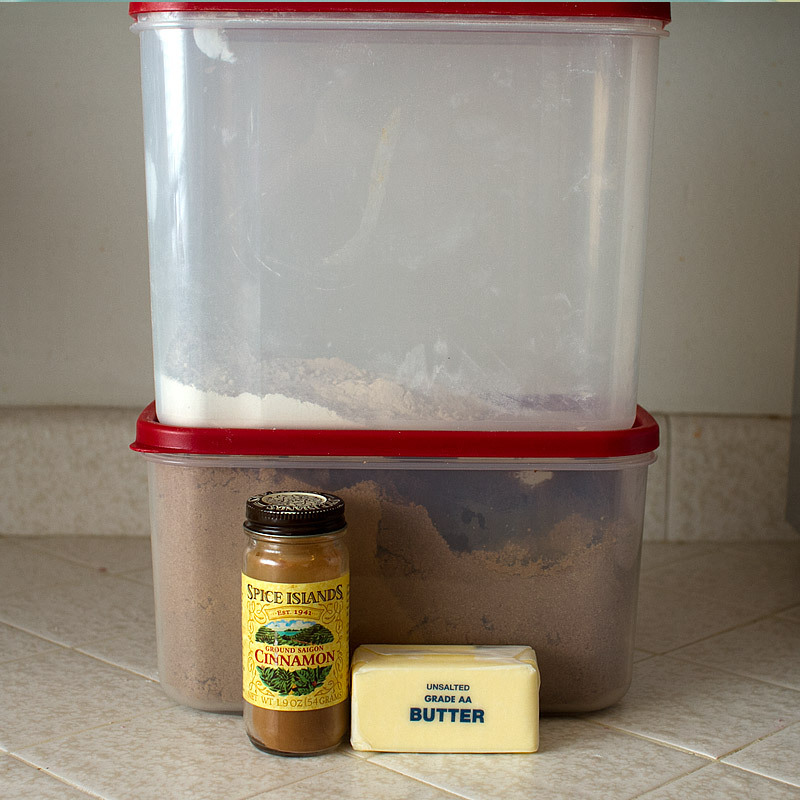 If you’re not using a mixer, stir in 2-3 cups flour with a wooden spoon, 1 cup at at time. Knead in the remaining flour. When the dough has just about doubled (let’s say, 30 minutes in), start on the cinnamon filling. Melt the butter and let cool for a few minutes. Add in sugar, flour, and cinnamon and set aside. 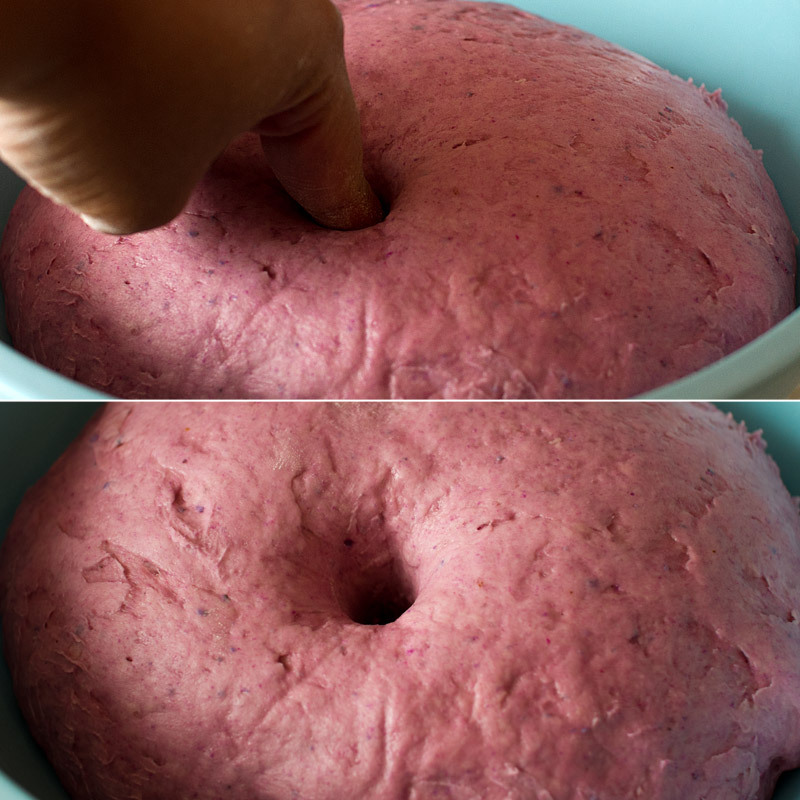 You should be able to stick a finger into the dough and have the indentation remain. Spread the filling on top of the rolled out dough. 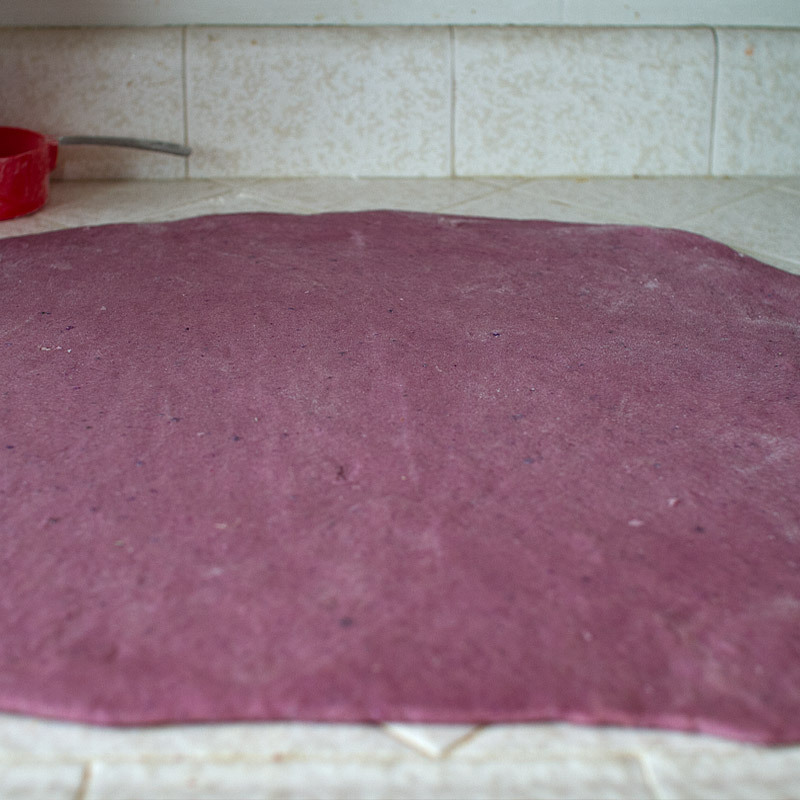 Leave a 1-2″ edge of dough with no filling (the edge furthest from you). Begin to jelly roll her up. Be gentle, but make sure you keep it right, keep it tight (holllaaa). The seam of the dough should be at the bottom. Cut into 14 equal pieces using either a very very sharp knife (a dull knife will squish the soft, delicate dough). You could also use a piece of unflavored / unscented dental floss to cut through the dough. 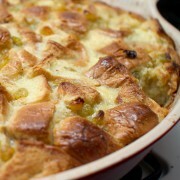 Place in a very well buttered pan, about 3/4″ apart from each other to allow room for the second rise. 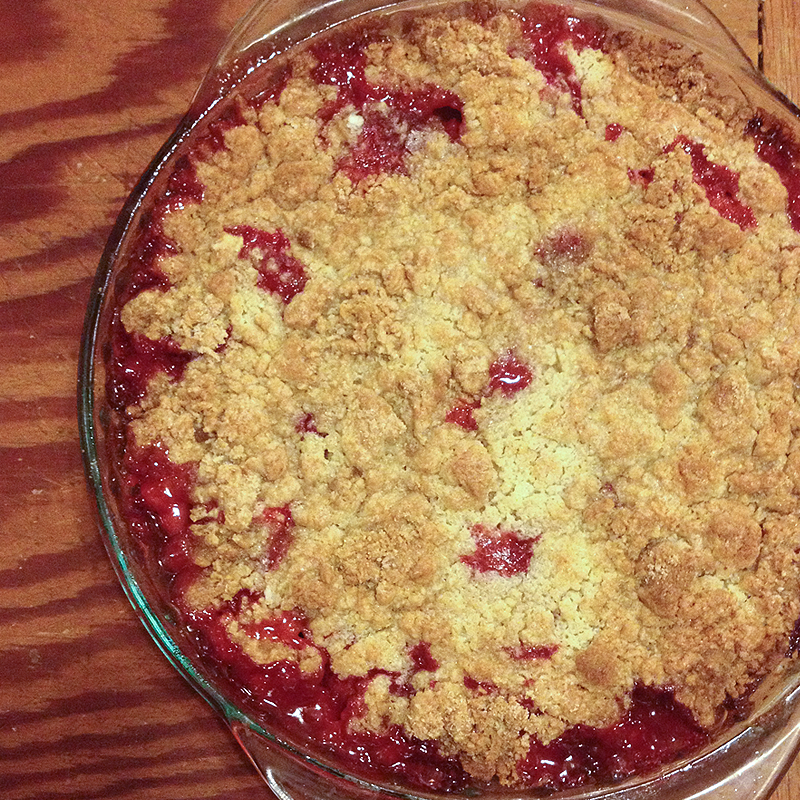 Listen to me when I say well greased – you don’t want to be trying to chisel burned sugar off your pan. How pretty are these, btw. Like little purple sugary roses. At this point you can choose to let rise an additional 30 minutes (back to that warm, dark place!) or wrap them tightly in plastic wrap and refrigerate them overnight (up to 16 hours) to make them the next day. 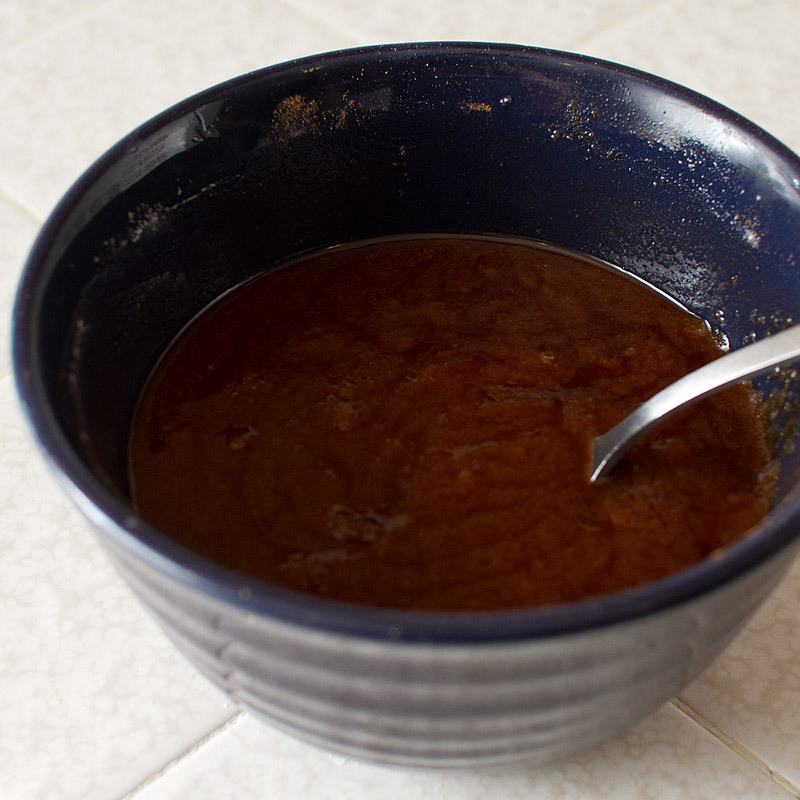 If you decide to go the “bake right away so I can eat this now” route, start on this glaze when they go into the oven. 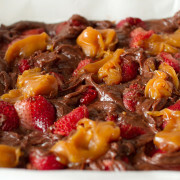 Otherwise, this caramel can be made ahead of time and refrigerated without any change to the texture. 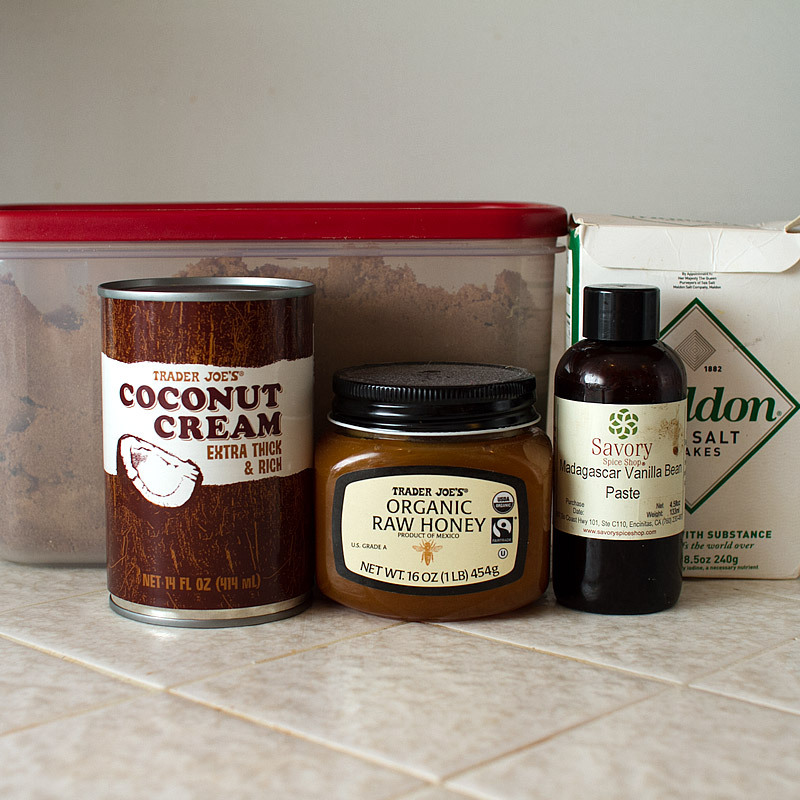 Combine the coconut milk, brown sugar and honey in a medium sauce pan. Bring to a boil, then reduce the heat so it doesn’t boil over. Let simmer for 15 minutes. We’re just trying to evaporate the water so the consistency is thicker. Preheat the oven to 350 and bake for 25 minutes, or until knife inserted comes out clean. Yeee! 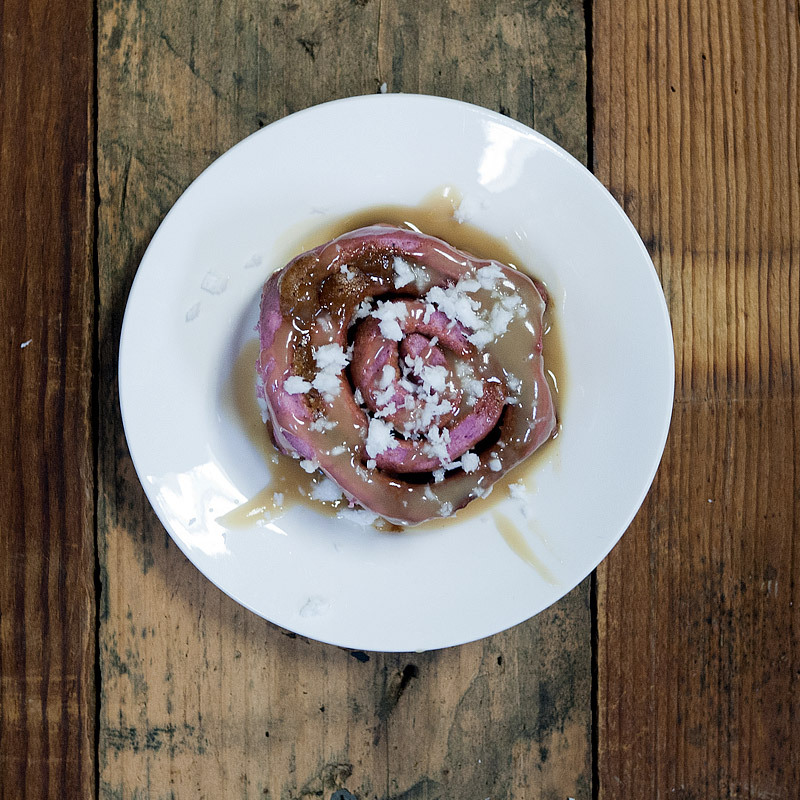 Drizzy drizzle the salted coconut caramel over the cinnamon roll. Since ube is traditinoally served with grated, unsweetened coconut, I topped her off with some. Totes optional. 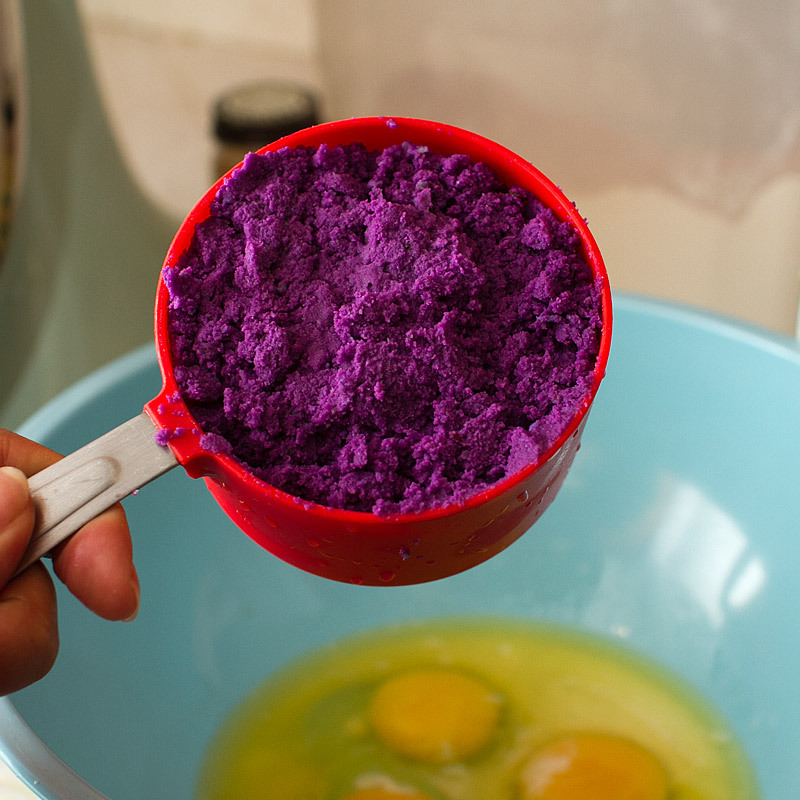 In a medium bowl, combine ube, melted butter, eggs, and one cup of flour. Set aside. 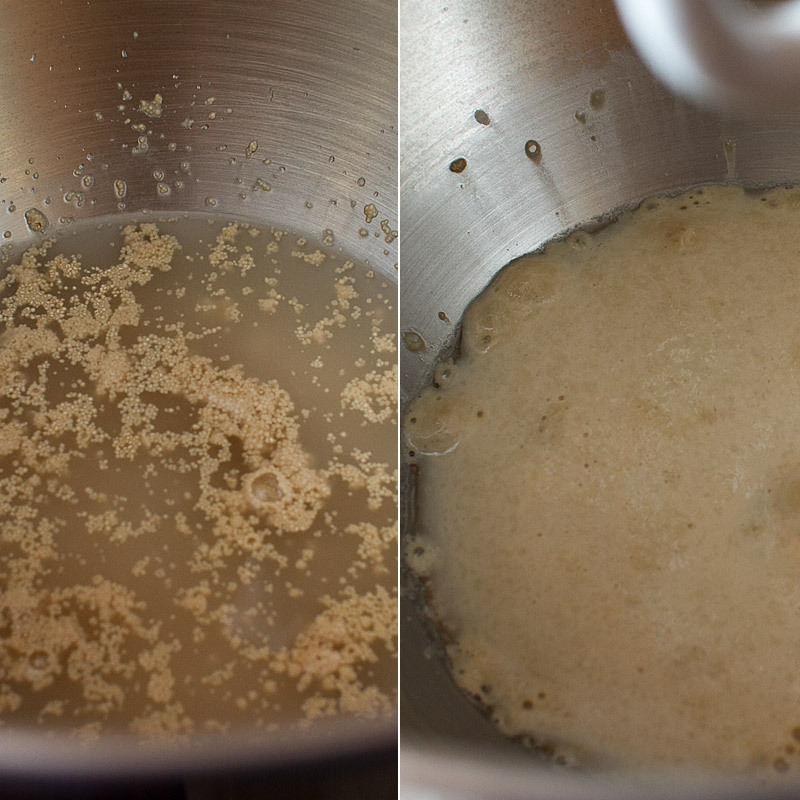 In the bowl of your standup mixer, combine sugar, yeast and water. Allow to sit and bloom, about 5 minutes. 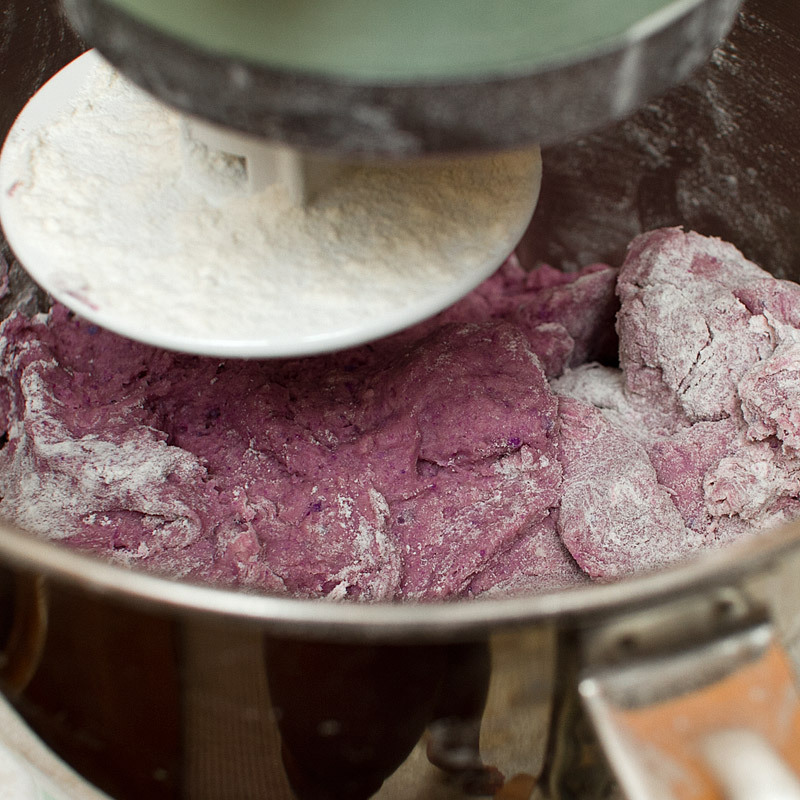 Attach your dough hook and add the ube mixture to the yeast. Add remaining 4 cups of flour, one cup at a time, until completely incorporated. 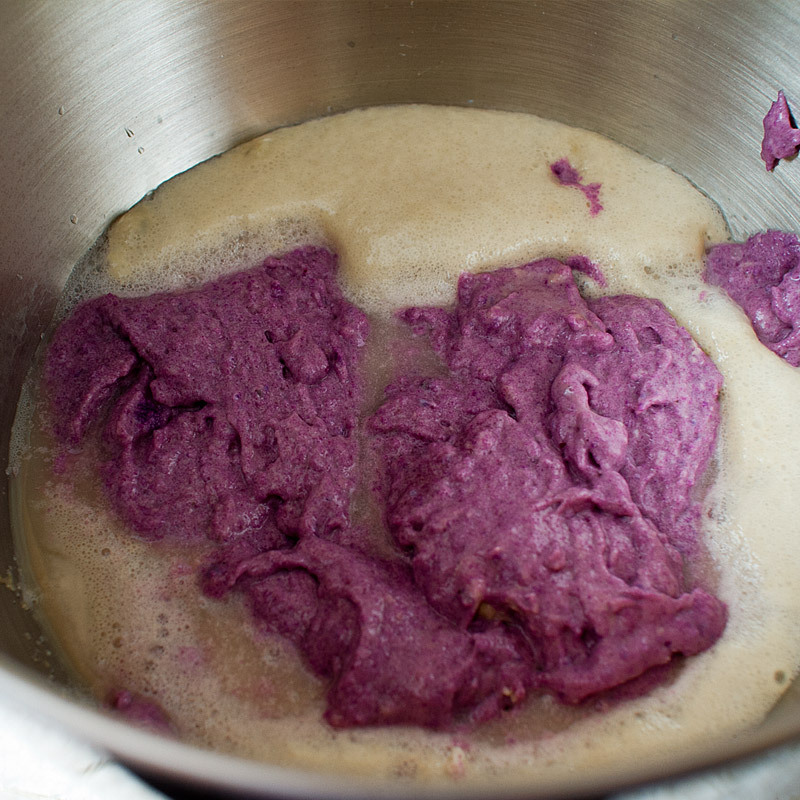 Add ube mixture to yeast and mix gently. Add flour, one cup at a time, and stir with a wooden spoon. After adding 2-3 cups, knead the remaining flour into the dough. Once all flour is incorporated, knead an additional 5 minutes. The dough will be slightly sticky. Grease a large bowl and place dough inside. 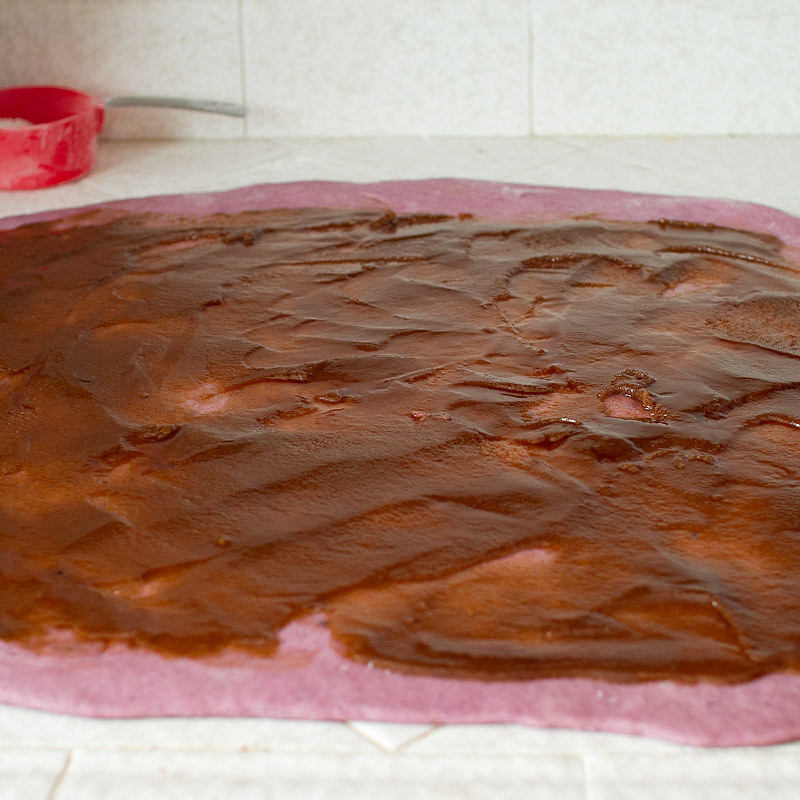 Cover with a damp cloth and set aside in a warm, dark place until dough doubles, about 40-60 minutes. When dough has almost about doubled, work on the filling. Melt butter and let cool. Add in brown sugar, cinnamon and flour and mix with a fork. Punch down the doubled dough, and roll out into a large rectangle. Mine was about 18″x15″ (totally guessing, I’m horrible with measurements… It was like, 1 1/2 forearms lol). 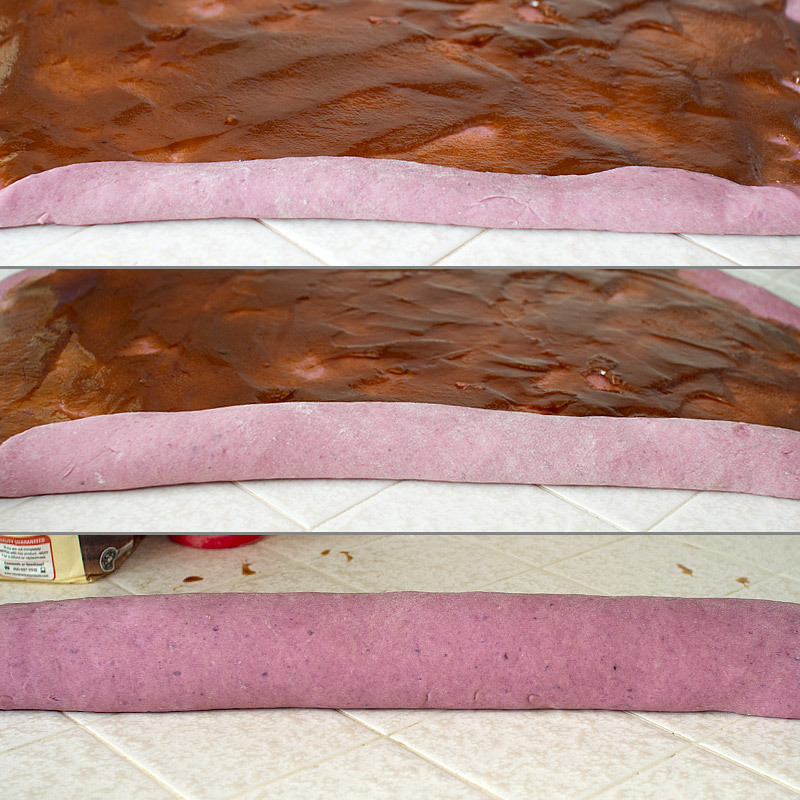 Pour filling over the dough and spread evenly, leaving 1″ of dough without filling at the edge furthest away from you. 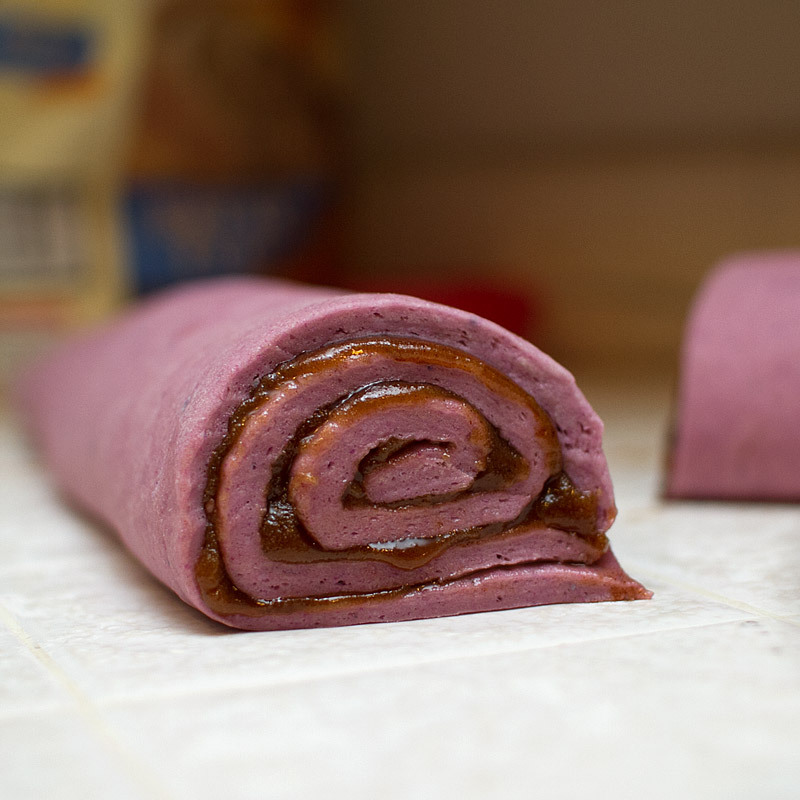 Starting and the longest side, lengthwise, roll up the dough like a jelly roll. Cut into 14 even slices with a sharp knife or a long piece of unscented, unflavored dental floss. Place in a well greased baking dish, cut side up, spacing rolls about 3/4″ apart. 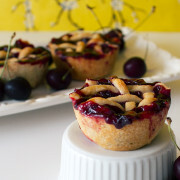 If you want to bake these immediately, let rise in a warm, dark place an additional 30 minutes. 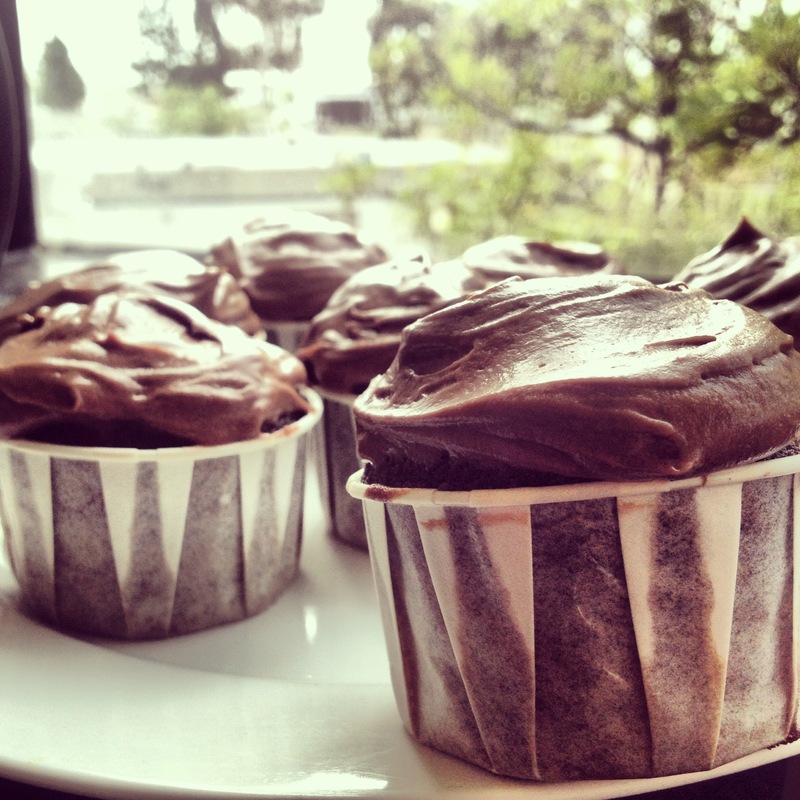 If you want to bake these the next day, wrap tightly with plastic wrap and refrigerate. 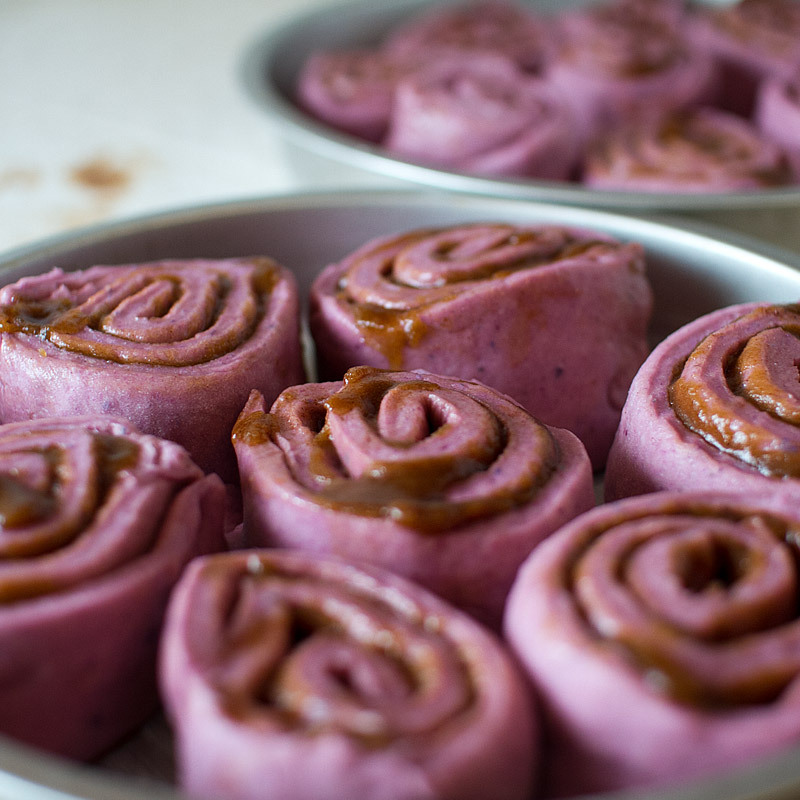 Before baking, let rolls come back to room temperature and then let rise – about an hour. Preheat oven to 350 degrees. Once the rolls have gone through their second rise, bake for 25 minutes. To test doneness, poke with a knife and make sure it comes out clean. Remove from oven and let cool for 10 minutes. 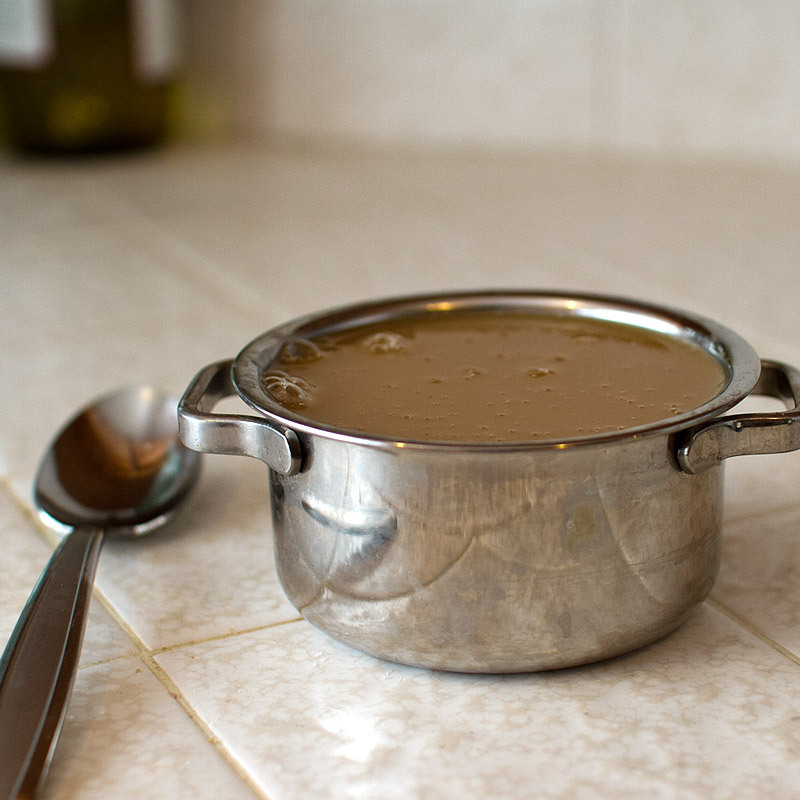 While cooling, start on the salted coconut cream caramel glaze. Combine coconut milk, honey and brown sugar in a medium sauce pan. 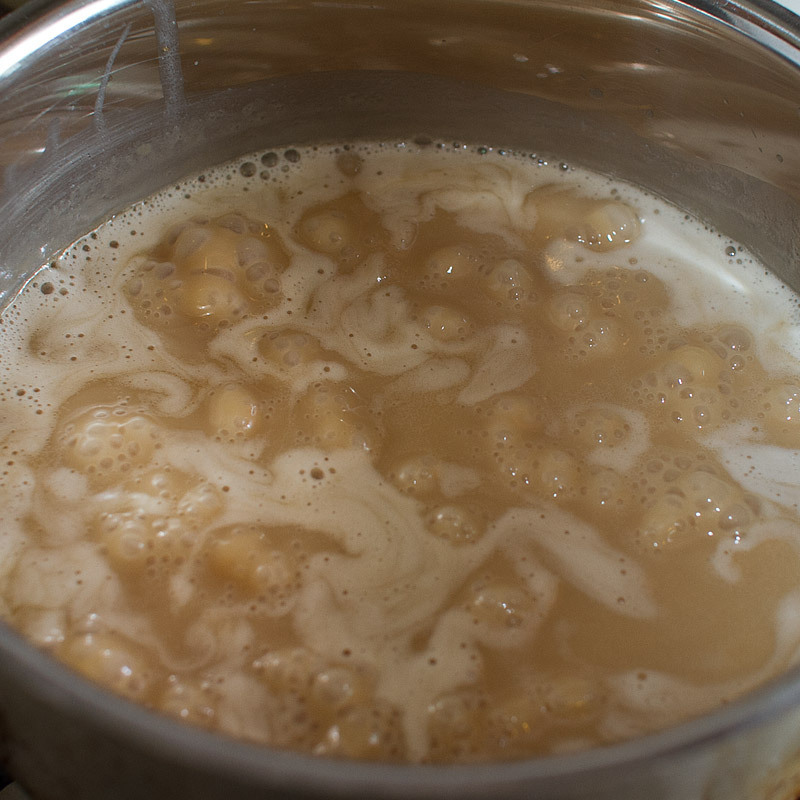 Bring to a boil, then reduce heat and let simmer until reduced to about 1 1/4 cups – about 15 minutes. Remove pan from heat and whisk in butter, vanilla extract / paste and sea salt. Let cool completely, then refrigerate. 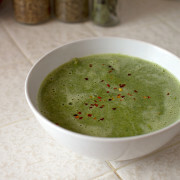 This will keep in an airtight glass jar in your fridge for up to 3 weeks. But it won’t last that long so it doesn’t matter. 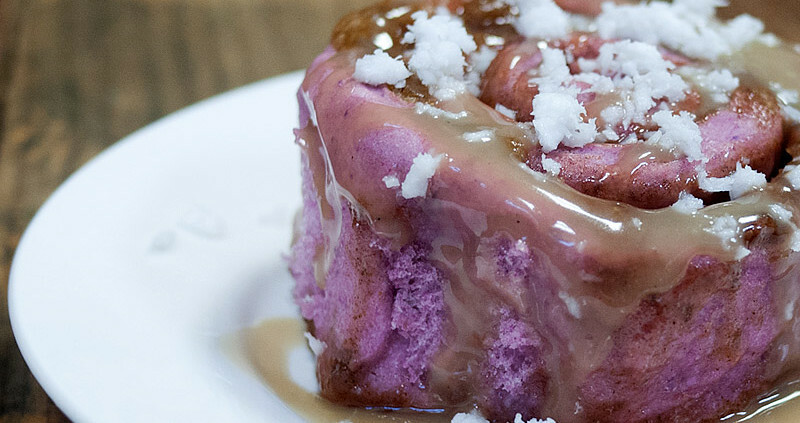 Drizzle salted coconut cream caramel over ube cinnamon roll..Garnish with grated, unsweetened coconut. These look insanely good! I love ube. Totally going to make them. 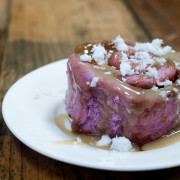 The coconut cream caramel reminds me of something drizzled in Filipino desserts and in ube jam called “latik”.